I already mentioned this back when Dave was a girl, but I generally had the characters appear in the Sunday strips just as they appeared in the daily strips at the same time, even if they were a different gender or species or whatever. So here’s Dave!Artie. I kind of wanted to draw him in color anyway. Yes, it’s another of the many contests devised over the years by the eternally enterprising James Rice. 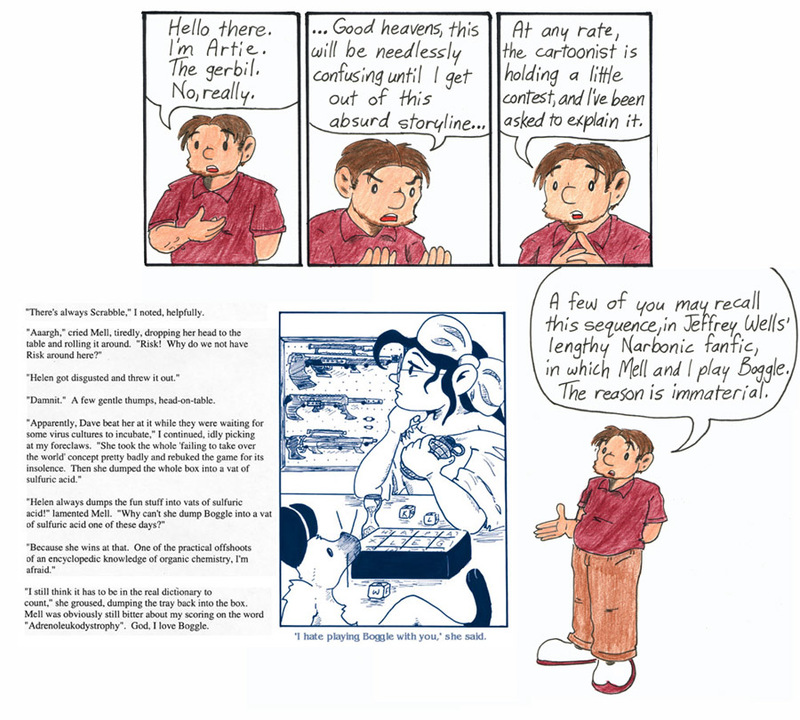 I’m always happy when someone writes a computer program to prove or disprove throwaway lines in my comic (or, in this case, fanfiction about my comic). It’s better when they’re proven than disproven, of course. But what, you ask, have James Rice and his gerbil Speedy been up to lately? Well, earlier this year, as the following photo essay by James shows, they visited the Talladega Superspeedway in Alabama. Of course Speedy took in all the regular tourist stuff like visiting the International Motorsports Hall of Fame. He snuck out to the finish line for a photo. That’s the kind of stuff any gerbil might do. But when Speedy goes to Talladega, that’s not quite enough. So he bummed a ride in the world’s fastest Mustang (a car that’s gone more than 250 mph), and, with real NASCAR driver “Wild” Bill Elliott behind the wheel, they tried to set a new track speed record. They picked up speed fast, but on the third lap, in turn two, at more than 180 mph, the car blew the right front tire and went into the wall. Fortunately no one was hurt, and though the car was bent and scraped, it will be fixed and run again. Speedy will be ready when they are. Thanks once again, James and Speedy! I really have no idea how I inspire any of this. Zoom, zoom, zoom went the gerbil! There, there, there goes ol’ Speedy! His adventures just boggle the mind! Vrroom, vrroom, vrroom went the engine! Boom, boom, boom went the tire! Doom, doom, doom! Now we’re crashing! We’re just lucky we didn’t catch fire! I’m glad I had my five-point safety harness on! The driver stunned … I pulled him free! It’s no big deal, I know he’d do the same for me! Where, where, where will they go next? Cheer, cheer, cheer for our Speedy! He’s the true fastest gerbil on Earth, and he’s worth any price! Thank you also, James Rice! I think the ‘upload’ button on your file transfer program must be malfunctioning if it keeps causing this stuff to happen. Said it before but I’ll say it again: James Rice, you are an American hero. This may be a bit late, but you’re assuming they were playing regular Boggle with only 16 cubes – there’s also Big Boggle (25 cubes) and Super Big Boggle (36 cubes). @seaking: It is, but evidently not in the Narboniverse. You didn’t really think public existence of mad scientists was the only difference, did you? Yes, yes, the 16 letter limit had to be ignored. 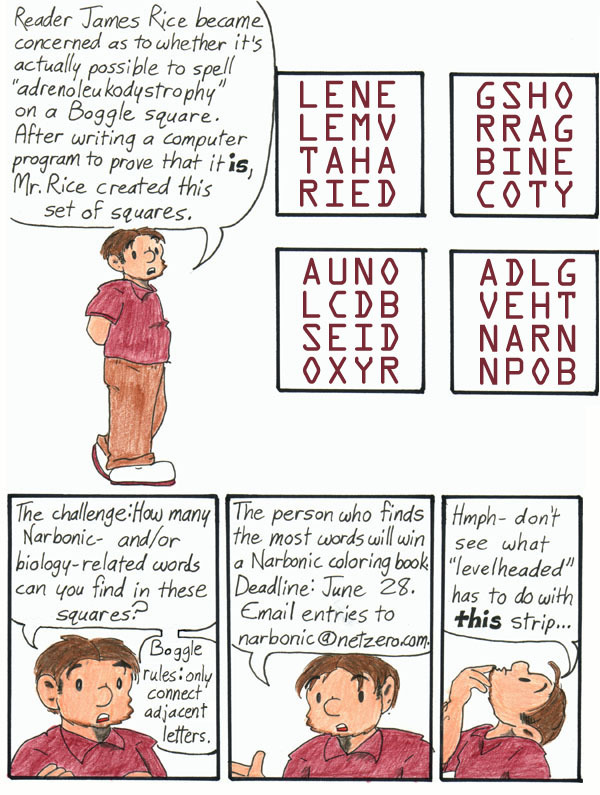 The program was to see if adrenoleukodystrophy could even fit on a Boggle square. Sadly, the Boggle fitting program was lost some time ago. As I recall it only took a few hours to write, (complete with graphics to show how it was doing in it challenge). I may have to rewrite it some time. Speedy hasn’t been still since Talladega in May. As soon as he returns from Africa, I’ll compile all his summer and fall adventures into a set and send them to Shaenon.